200-gram pressing by Quality Record Pressings has a flat edge profile and deep groove label, true to the original LP Deluxe high-gloss tip-on album jacket Part of the ultimate audiophile Prestige stereo reissues 25 of the most collectible, rarest, most audiophile-sounding Rudy Van Gelder recordings ever made. This release of Lightnin' Hopkins Soul Blues completes the series of 25 Prestige label stereo reissues from Analogue Productions. Of the 50 titles (25 stereo, 25 mono) in this reissue series, 49 of them were mastered by Kevin Gray at Cohearent Audio from the original analog tape. For Soul Blues Ryan Smith at Sterling Sound created a 24/192K hi-res file from a needle drop on a clean original LP. This was done because the tape supplied for mastering proved to be from a needle drop itself, not the original, which has been lost since the early 1970s. Smith took the original LP, did a new needle drop and meticulously worked to eliminate the minimal tics and pops that remained. Then he mastered the album for LP and SACD from the hi-res file. "We are amazed by the quality," "Now that the tape is lost, an original LP copy is now the master. Only in cases where the original master tape is lost or damaged and where we feel that we have no other choice, do we consider using the best source that remains. But we'd only do that if that source was sonically worth it. In this case, it most definitely is." A true poet of the blues, Lightnin' Hopkins was a master of tall, tongue-in-cheek tales, often made up on the spot in the recording studio. The first song on this album, "I'm Going to Build Me a Heaven of My Own," describes an encounter with a bearded man claiming to be Jesus Christ. Hopkins also puts his personal stamp on Willie Dixon's "My Babe" and Smokey Hogg's "Too Many Drivers," among others. 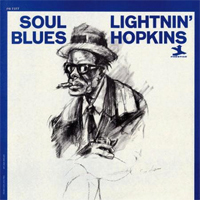 Texas bluesman Lightnin' Hopkins career was both long and fruitful. He performed live for six decades and recorded for over 30 years, amassing a catalogue that was larger than almost any of his contemporaries. Not only was he prolific but also he was also a great raconteur and a very good live performer with an 'act' honed to perfection at pre-war dances and parties. "So I went ahead and made me a guitar. I got me a cigar box, I cut me a round hole in the middle of it, take me a little piece of plank, nailed it onto that cigar box, and I got me some screen wire and I made me a bridge back there and raised it up high enough that it would sound inside that little box, and got me a tune out of it. I kept my tune and I played from then on." – Lightnin' Hopkins Hopkins's guitar playing was unconventional, some even called it ragged, but it is not as a guitarist that he will be remembered. Somehow the way he set his songs, seemed totally apposite and it gave everything he did an authenticity that few others were able to match. He first recorded in November 1946 in Los Angeles, where he cut 'Katie Mae Blues', with pianist Wilson 'Thunder' Smith; they were billed as Thunder and Lighnin'. At the same time as recording for Aladdin, he cut records for Goldstar in Houston, sometimes the same songs; he would go on to record for over twenty different labels. . Hopkins had a brief hiatus away from recording, between 1954 and 1959, as electric blues had come to dominate and he somehow seemed old fashioned. In 1959, he was 'rediscovered' when Sam Charters recorded him for The Folkways label. Throughout the 1960s his prolific output appeared on a variety of labels. 'Mojo Hand', one of his best-known songs, dates from this period and can be heard on his Verve Folkways album, Lightnin' Strikes. During the sixties he played many prestigious venues, including Carnegie Hall, the Newport Folk Festival as well as touring Europe with the American Folk Blues Festival in 1964. For a chance to hear Lighnin' and his pulsating guitar check out his 1964 album, Swathmore Concert. In the 1970s he was still very active in recording and playing live, although as the 80s rolled around he was beginning to see a downtown in his unique brand of Texas country blues. He died of cancer in 1982. Recording Date: Rudy Van Gelder Studio, Englewood Cliffs, NJ, May 4 & 5, 1964. 9. Darling, Do You Remember Me?